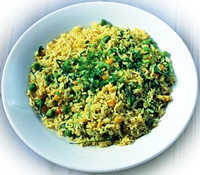 Pressed rice (chiwara) is very popular in North India for preparing various snacks and this is one of the popular recipes. Heat butter in a pan and add cumin seeds. Turn the heat to medium and add ginger, chili ,coriander and, turmeric powder. Fry for a few seconds. Add peas and stir about 4-5 minutes. Reduce heat. Add chiwara, salt and garam masala and mix well, keep about 5 minutes on low heat. Add coriander leaves and remove from heat. u have mentioned chiwra but it is actually called jada poha. chiwra is a type of readymade snack available at the stores. if you will add some sugar and lemon juice in this recipe then it will taste much better.